It is time to visit the Snippets Playground again even though it is a horrible grey and rainy morning so I guess it will be macs and brollies all round. I've used up a few more of my snippets making another Christmas card starting with the last remaining snippet of a piece of watercolour paper which had been coloured with Pixie Powder and salt. I then found a reasonably sized piece of white to emboss the igloo, followed by some smaller pieces of black, orange and white for the die cut penguins. Rather than cut tiny pieces in red I used a pen to colour the bow tie and tiny hat. I'm not entirely sure whether penguins live where there would be igloos but I'm claiming artistic licence here!! 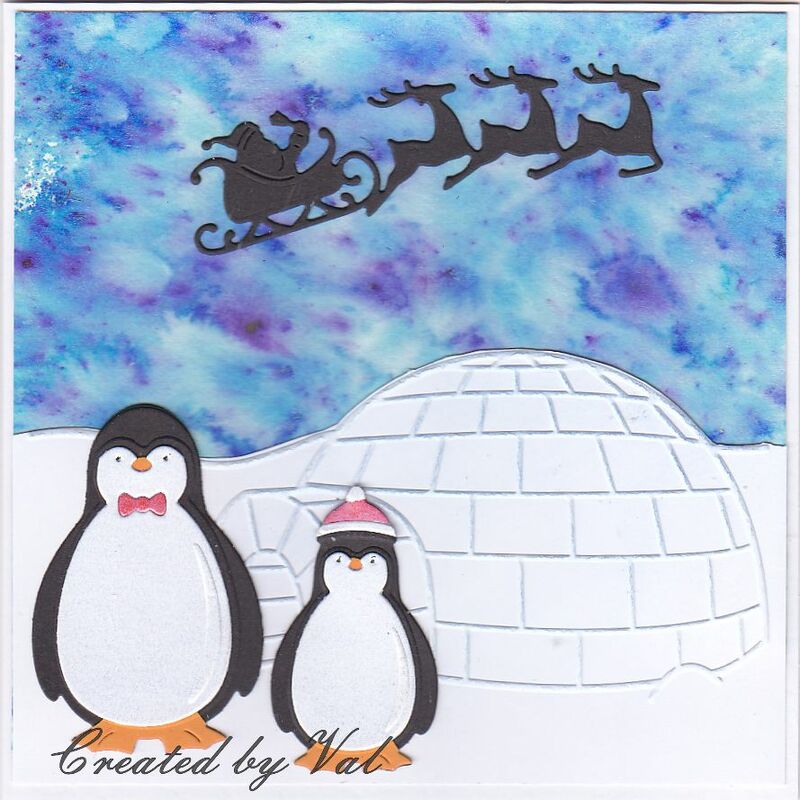 A final piece of black card was used to die cut the Santa and sleigh flying across the sky and because this is so obviously a Christmas card I've not added any words to the front although they will be on the insert. As usual there is a great prize to be won by a lucky entrant and if you visit the Playground later there should be pictures of two cards for inspiration (one from a guest designer isn't showing up at the moment but should be there later). I'm sure there will also be a link to Megan's blog so that you can visit to see more of her work. oh I love this wonderful snippets card, and your super design you have created. The Pixie powder background looks awesome, and that scene is brilliantly created. Yes I too have had the Crafters Companion white card stock with the silver or gold hint in it, but this card I bought at Hobbycraft , and was completely different to those, and it was definitely more ivory than white as stated. Maybe they are making different types now as this was double sided pearlised. What a cute snippets card! Even penguins have Santa come bring them pressies :) Love the igloo and that gorgeous background! I'm with you all the way on Google + - don't much care to join it! Another fantastic card from the snippets box and one to go into the christmas box too. I'm loving your backgrounds with the pixie powders and the gorgeous colours too. Super PP background and lovely wintry scene with your snippets. Oh Val, this really is just adorable! Beautiful sky and those penguins on parade are so cute! A lovely snippets card.